The Department of Geography at Forman Christian College arranged a ‘Geography Awareness Week’ from 23 to 27 January 2012. This celebration was organized to draw attention to what geography is, why it is important, and how students can ensure access to a robust geography education that prepares them to participate in global social and economic activities and make decisions regarding people, places and the environment. In this connection, a lecture was delivered by Professor Riaz Ahmad Sheikh (College of Earth and Environmental Sciences, University of the Punjab, Lahore) on 23 January on ‘Natural Hazards with Respect to Plate Tectonics’. On 24 January another lecture was given on the ‘Role of Forests in the National Economy’ by guest speaker Syed M Akmal Raheem (Divisional Forest Officer Publicity Wing, Punjab Forest Department, Lahore). A movie ‘Volcano’ was presented and a quiz competition was held on 25 and 26 January respectively. 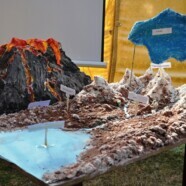 The Awareness Week ended with a model/poster competition on 27 January in which students from the Department of Geography prepared and exhibited models and posters to create awareness of fundamental concepts of geography among Formanites. Dr James Tebbe (Executive Vice Rector FCC) was the Chief Guest at the event and gave prizes to the winners. The students will leave for a study trip to Mangla Hydel Power Project on Sunday 29 January.